The book, Communication through the Ages: An Indian Perspective, is based on an altogether new concept and a multi-dimensional definition of the word, rather, term communication, going much beyond its conventional definition 'to connect' and not limiting it to verbal, written, or print and electronic media, or radio, television, satellite, computer and cellular telephony means and tools of connectivity. At a mundane level, it includes audio-visual presentations by means of theatre, folk songs and classical music as well as through medium of dance - all leading to aesthetic and sublime experience not necessarily making knowledge of language essential for their appreciation. And at a supra-mundane level it connects man with other worldly experience and extra-sensory perception, viz., god, heavenly bodies and transference of vital energy through the means of reincarnation etc. The book comprises of twenty contributions of experts and specialists belonging to different schools of thought and diverse disciplines. Mr. Upendra Vajpeyi was a freedom fighter, a veteran journalist, one of the founders of U.P. Working Journalists Union and Indian Federation of Working Journalists. He conceived and organized residential colonies for journalists' in Delhi and Gurgaon. He was founder General Secretary of the National Media Centre as well as founder Secretary of the Media India Centre for Research & Development. He was himself a communicator par-excellence who had conceived the idea of this book and had also collected the articles being published here. 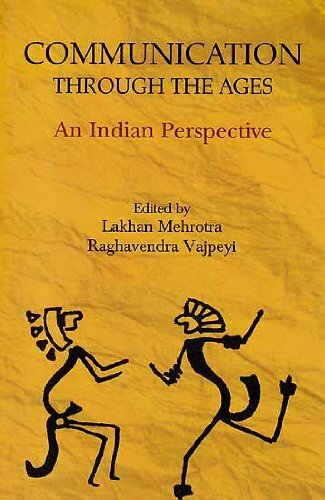 The Editors: Mr. Lakhan Mehrotra is an erudite scholar of Sanskrit, history, Indological studies and diplomacy (both theory and practice). After a brief period of teaching post-graduate students of the Allahabad University, he entered Foreign Service and took up several diplomatic assignments in different countries. Ambassador Mehrotra retired from the position of Secretary in the External Affairs Ministry. He also served as U.N. General Secretary's personal representative in Cambodia and Head of the U.N. Mission in Jakarta (Indonesia). Dr. Raghavendra Vajpeyi is a professional historian who has experience of teaching undergraduate and post-graduate students in Delhi University for more than four decades. Apart from his published doctoral thesis, he has to credit a fairly impressive number of published research papers and articles on various aspects of socio-economic, political and cultural history of early India.